Snorepin – the smarter solution against snoring. This recently designed and real, functional Snorepin is one of the best Snore Stopper products so far. The Snorepin, with its advanced, anatomic and conical shape feels very comfortable in the nose and looks unobtrusive. It leads to a much better breathing during night-time. It reduces snoring and, in doing so, it helps to save your relationship with your partner! 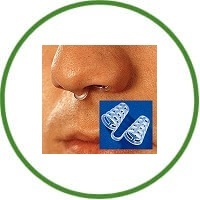 Unlike other nasal dilators, which have a plain surface, the Snorepin is designed with little slits on its surface. Because of these slits, the nose hair has the ability to go between these little slits to filter the air in a natural way by catching airborne particles and preventing them from reaching the lungs. In our days, the nose hair is mostly trimmed to a few millimetres. Nonetheless, it’s easy for the hair to find its way through the little slits on the Snorepin. To terminate snoring, always try to prevent to sleep on your back! This product is intended for use in the nose only. Do not swallow. Do not use this product on children under the age of 10.